The Law and Society pathway is an unique and unrivaled pathway that is offered to students at Santa Susana High School. In addition to the rigorous and applicable courses that the pathway offers, Santa Susana High School has a nationally recognized Mock Trial program. Mock Trial is a fabulous opportunity for students to apply the legal skills they're learning in their academic courses. Santa Su's Mock Trial teams have placed in the top ten in international and local competitions over the past six years. These competitions are rigorous and offer students many opportunities to compete at county, state, and national levels with teams from many other countries in locations around the United States, including California, Georgia, and New York. Students who are successful in the Law Pathway, leave with a greater understanding of the law and a huge head start on the commensurate skills it takes to be successful in a legal career. The Law and Society Pathway is a program designed to introduce students to authentic learning experiences that exposes them to opportunities in legal careers. The courses offered in this pathway offers students opportunities and exposure to the law in a variety of ways. Students will have the opportunity to participate in rigorous academic courses such as Applied Legal, Logic and Ethics, Law and Order, and Criminal Justice. These courses introduce fundamental aspects of the law, while encouraging students to approach the law from multiple perspectives. These courses challenge students to think critically, to present compellingly, and to challenging prevailing perspectives. 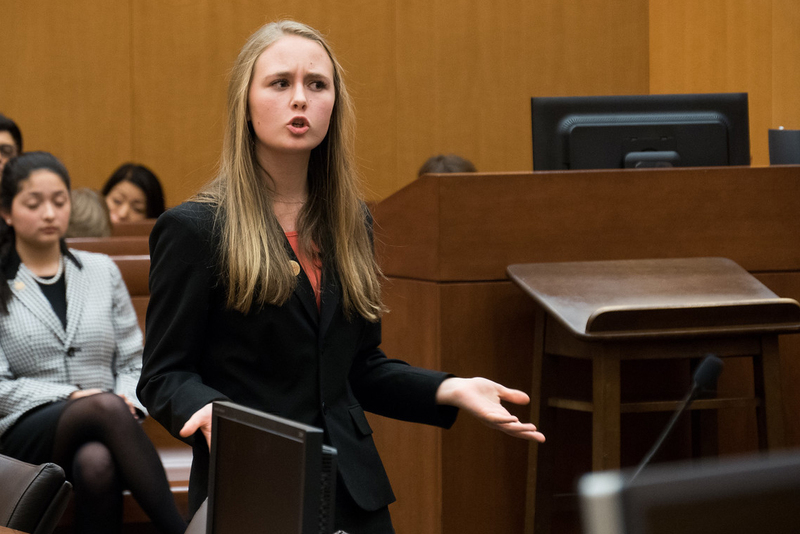 In addition to these academic courses, this pathway gives students opportunities to participate in the locally and nationally recognized Santa Susana Mock Trial program where students prepare and present trials to cases on controversial and relevant issues. This program encourages students to think critically and make logical arguments and resolutions to challenging topics. The academy includes four courses and the Mock Trial program. To certify in this academy, students must complete three of the four courses with a C or better. To certify with Honors or High Honors, the requirements are listed below. This year long course exposes high school students to Western philosophical thought, focusing on ethics and logical reasoning. Students will learn critical thinking tools that will help identify and evaluate arguments. Moreover, knowledge gained in this course will help students produce good arguments. Students will build their reasoning and critical thinking skills and they will learn to identify a number of defects or fallacies of reasoning. Students will also learn to identify categories of philosophic thought, rhetorical arguments, and will be able to make the distinction between good and bad arguments. The focus will be on Philosophy of Mind, Philosophy of Science, Philosophy of Politics, and Aesthetics and Human Nature. Law and Order is a year long course that gives students an opportunity to receive in-depth exposure to various careers in the field of law. Coursework in the classroom will be heavily supplemented by regular guest speakers from different branches of law enforcement and legal fields. Students will have frequent opportunities to learn directly from professional visitors to the classroom who will offer both direct instruction and practical advice about their careers. These classroom-based units of study will be complemented by a field internship during the spring semester. This course will be divided into ten units of study: Law and Public Policy, Settling Disputes, Crime in America, Criminal Justice: The Investigative Phase, Criminal Justice: Charges, Plea Bargaining, the Trial, Sentencing and Corrections, Juvenile Justice, Tort Law, Consumer Law, Family Law, Law & Society Internship. Criminal Justice is a year long course that provides an introduction to the criminal justice system. The primary goal of this course is to develop a general understanding of the criminal justice system and its response to crime in society today. Students will explore the amount and potential causes of crime in the U.S., analyze statutory and case law as it relates to criminal justice, explore the key elements of the criminal justice system (policing, courts, and corrections), and examine a number of special issues relevant to criminal justice today. Applied Legal Studies is a year long course in criminal law that allows students to learn about the judicial system through courtroom simulations including mock trials, case studies, and real life experiences including guest speakers and courthouse visitation. During this course, students develop their written and oral advocacy skills, while they prepare a trial court motion and present a mock oral argument in a trial court format. Students will also argue constitutional issues based on case law during pre-trial arguments before a judge, usually the teacher or a real judge from Los Angeles or Ventura counties. This course prepares students for real life court experience in writing examinations, preparing a case, and presenting before a judge and a jury. Certification: Three of the four courses offered (Criminal Justice, Applied Legal, Ethics and Logic, and Law and Order) with a C or better in each class taken.Certification with Honors: Three of the four courses offered (Criminal Justice, Applied Legal, Ethics and Logic, and Law and Order) with a 3.5 GPA or better in each class taken. In addition to the courses taken, students must have participated in at least two years of the Mock Trial program offered at Santa Susana High School.Certification with High Honors: Three of the four courses offered (Criminal Justice, Applied Legal, Ethics and Logic, and Law and Order) with a 4.0 GPA or better in each class taken. In addition to the courses taken, students must have participated in all four years of the Mock Trial program offered at Santa Susana High School.